Status: Contest finished on 01-03-2010. 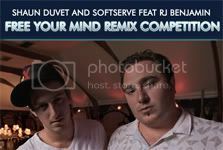 New remix contest by Shaun Duvet & Softserve. The track to be remixed is Free Your Mind. Good luck! The boys have teamed up to produce one seriously rocking dance floor killer! Free Your Mind was slowly introduced into a group of the world’s best DJs, producers and record labels at the end of the last year. Now with label plans for a full release package we area giving you the chance to create your own remix of the hit track. We already have some incredible releases from the likes of Chris Sen & Kyle Worde, plus many more. Get involved and who knows your remix just may be the next big thing on SA & world wide dance floors!